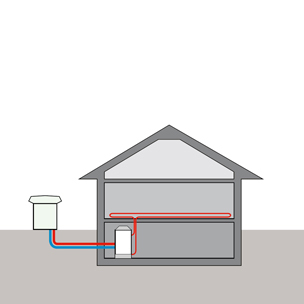 Heat pumps convert energy stored in the air, water or beneath the ground into heating energy. They can also be combined with a domestic hot water system, to give you a constant supply of hot water. The energy we use, taken from the air, water and earth, will always be available to us, giving us a limitless energy supply. STIEBEL ELTRON has a range of high efficiency heat pumps to heat your home and your water and provide cooling that's suitable for all homes and buildings. New or renovated, indoors or outdoors, we can meet all your needs. A heat pump system converts environmental energy into heat for your home. First, the heat in the ground or outdoor air is transferred to a refrigerant via a heat exchanger (evaporator). With help from a compressor, the refrigerant boosts this energy to a higher temperature level, making it suitable, via another heat exchanger (condenser), for heating your home or your domestic hot water system. Depending on the energy source, with one-part electrical energy, you can convert up to five parts environmental energy into heating energy. The temperature of the environmental energy, if it's sitting between -20°C to +35°C, is brought to a temperature level ideal for heating your hot water system. During this process, the water is "pumped" from the low temperature level to the right level. Did you know the use of renewables is set to overtake fossil fuels? With the right energy management, you can efficiently generate and store energy for your home. By using our tailored service, we can help you get the maximum benefit from your heat pump after having it installed by a qualified contractor. We even provide a five year warranty for your peace of mind. 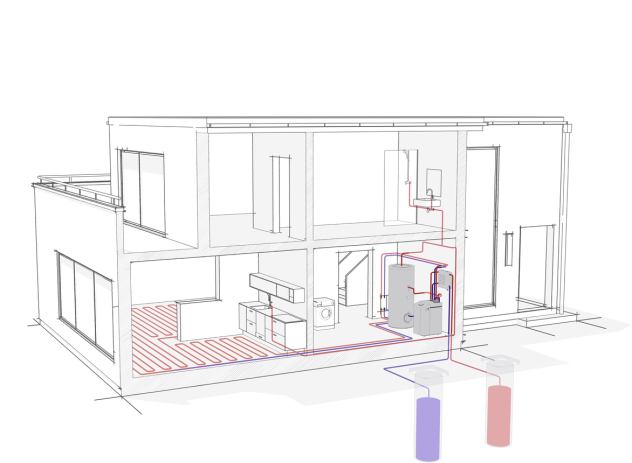 How does a heat pump heating system work? It draws energy contained in the ground, air or water and transfers it to the heating system in your home. Which energy source is your heat pump using? Air heated by the sun is everywhere. Unfortunately, during winter when you're most likely to need a warm home, outdoor air is at its coldest. Luckily, our domestic heat pumps can still extract enough energy from outdoor temperatures that are as low as -20°C, meaning you can heat your home whenever you like. One of the best things about air source heat pumps is their ease of installation. No extensive groundwork or well drilling is required, so you'll have a warm home before you know it. Geothermal heat pumps absorb the heat from the ground through pipes laid underground. Inside these pipes is an eco-friendly brine, which takes the absorbed heat to the heat pump's evaporator. 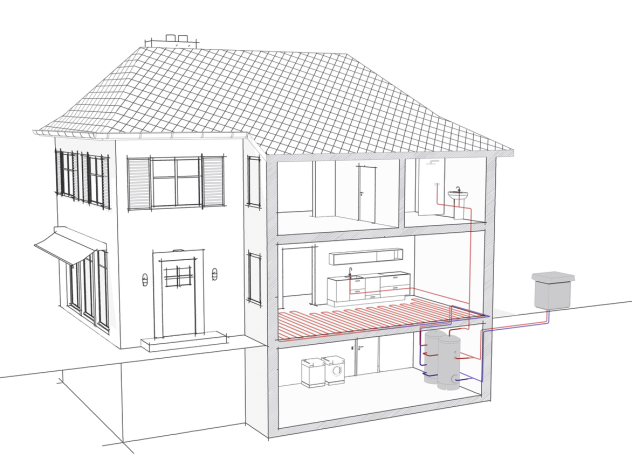 There are two types of geothermal heat pumps, with two very different installation methods. The pipework needed for these systems can either be inserted into boreholes drilled deep into the ground or laid horizontally near the surface. Geothermal probes, which are inserted up to 100 metres below the ground in vertical boreholes, have the advantage in that they do not take up a lot of space. 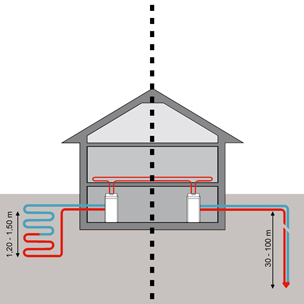 The horizontally laid geothermal collectors are laid only 1.5 metres below ground level but need about two to three times as much surface area as the living area you're heating. If your property is large enough, you can use a geothermal heat pump to take advantage of the almost inexhaustible supply of energy available to you from the ground. Even better, these heat pumps are virtually maintenance-free. Groundwater can be a great storage for solar heat. Even on the coldest days in winter, it can maintain temperatures of +7 °C to +12 °C. The steady temperature level of this energy source means your heat pump can achieve an almost constant performance all year round. The only downside – groundwater in quantities high enough for use aren't always readily available. It's still worth checking if it's an option for your home, though a delivery and return well will need to be drilled on your property. There are many different types of heat pumps, each working in a different way and utilising a different energy source. In our comparison, we show the differences in power generation, sites and required conditions and measures. This way, you can choose the right heat pump for your needs. The air source heat pump is your best choice if space is limited. The costs of both heat pump and installation are also low. Air to water heat pumps are very versatile: given their low cost, they offer very high efficiency levels. Is your groundwater unsuitable? Then the brine-water geothermal heat pump is your best choice! Installation costs and effort differ between homes. The heat pump's efficiency is very high here. The heat source can also be used beyond the heat pump's service life. Is your groundwater unsuitable? Then the brine-water geothermal heat pump is your best choice! Installation costs and effort differ from house to house. The heat pump's efficiency is very high here. The initial outlay is comparatively high, but this is offset by a very good efficiency during operation. 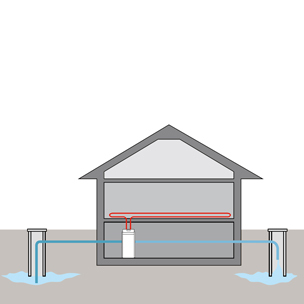 Length of service life depends on the quality of the groundwater, but it's generally comparable with that of a ground source heat pump. The conditions required for this type of heat pump are not always available, however. Do you want a highly efficient, CO2 heat source for your home? Our heat pumps are the best choice for today and an ideal fit for the future. But which system is right for your building? 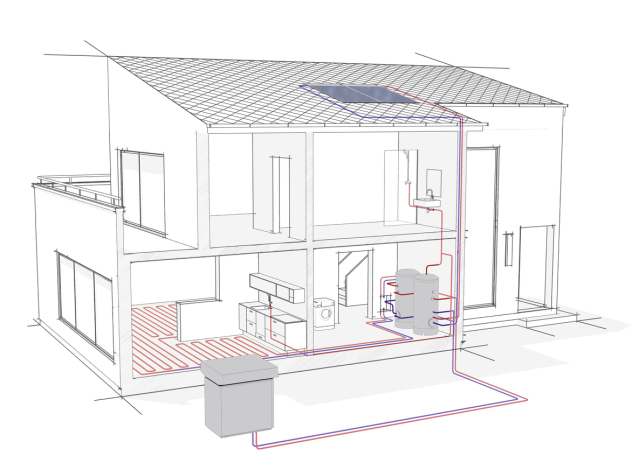 Basically, there is no building in which the use of a heat pump would not be possible. From brand new, eco-friendly homes, through to retrofits, and even older homes, STIEBEL ELTRON has the right heat pump solutions for buildings of almost any shape and size. What is the difference between indoor and outdoor heat pumps? The main difference between an air source heat pump in Australia is essentially where they are installed – either inside or outside your home. Outdoor installation is usually the cheaper option and is particularly popular in new builds. However, in highly built-up residential areas where space is at a premium, indoor installation has a clear advantage thanks to its minimal noise emissions. That, and it takes up no space outside the home. As a result, it makes no difference to the homes façade – which makes it a great choice when you aren't able to make changes to the appearance of the building. Unlike air sourced heat pumps, geothermal heat pumps are always installed indoors. Regardless of how airtight your home will be, if you're building a home, you should take this opportunity to install the energy source of the future. 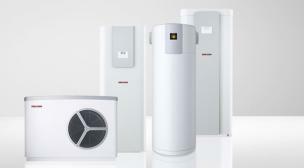 Our highly efficient heat pumps are the only option you should use. 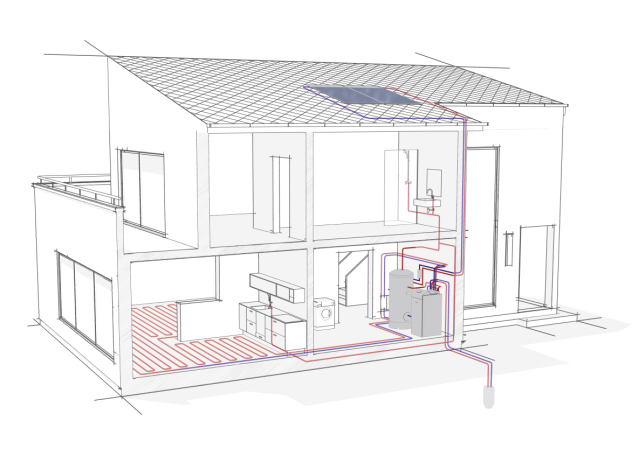 Complete systems with integral ventilation are ideal for convenience, but separate ventilation units or heat pumps can also make a good choice. By using environmentally friendly and sustainable energy technology, you're contributing to the responsible use of our natural resources. You'll also be able to take advantage of the wealth of potential for savings, especially when modernising older buildings. Moving away from finite resources, such as coal powered electricity, is increasingly important here as well. After all, independence means freedom. This is exactly what you'll get when you invest in a modern heat pump in Melbourne. Not only will you be able to reap the long-term benefits, your personal energy transition will also add value to your property.  With decades of innovations, STIEBEL ELTRON has always been a pioneer of the latest technologies. Our product range includes products certified for new passive houses that satisfy all European renewable energy requirements. Our LWZ 504 inverter integral unit is a great example of how we've applied energy standards to our latest products. Our products also carry the "ErP" energy label, which rates each product's energy efficiency. The European Heat Pump Association (EHPA) represents the interests of the European heat pump industry, aiming to further promote heat pump heating technology across the European market for residential, commercial and industrial applications. We feel honoured to have the independent EHPA quality label on our products, which underlines their quality and value. On top of this, STIEBEL ELTRON is also committed to working with all the relevant associations across the world. 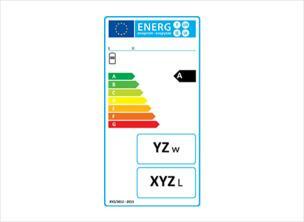 An example of an A heat pump energy rating "ErP" label. The top of the "ErP" label displays the name of the manufacturer (I) and the model designation (II) of the product. The rating system places the heat pumps into nine efficiency classes. A++ is the highest energy efficiency class, whilst G denotes appliances with extremely poor values. STIEBEL ELTRON products are almost exclusively in the top efficiency class, with all STIEBEL ELTRON heat pumps only receiving A to A++ ratings. More information about the "ErP" label can be found in our FAQ page. 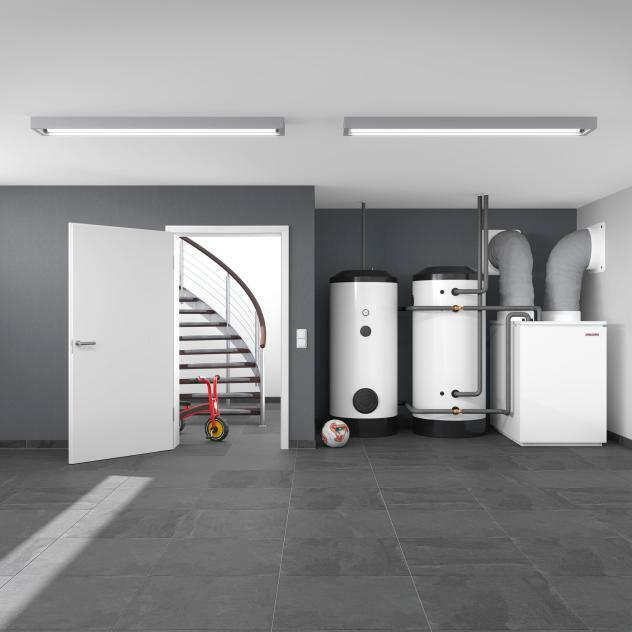 Products from STIEBEL ELTRON have received internationally recognised awards for their outstanding design. These include the Red Dot Award (an international design competition for businesses) and the iF Design Award (celebrating efficient, aesthetically pleasing and ethical designs). The design, research and development for all of our products is carried out in Germany to guarantee our "Made in Germany" quality. The STIEBEL ELTRON Group's largest production facility is located in Holzminden, Lower Saxony, though we have facilities worldwide, in order to meet the needs of our international clients. We can look back on more than 40 years of experience in the development and production of heat pumps. We're proud to offer our state-of-the-art heat pump systems across Melbourne, Sydney, Canberra, Brisbane, Darwin, Perth, Adelaide, and Hobart.